Passports with Purpose (PwP) is a collaborative online fundraiser created by four Seattle-based travel bloggers, returns for a second year with the goal of raising USD13,000 to build a school in rural Cambodia through American Assistance for Cambodia (AAfC). As of this writing, they are just a few hundred dollars way from their goal. I caught up with Pam Mandel, one of the organizers, to learn more about their fundraiser, their strategy, and the charity. It's not like I had a "passion for social media" but I have always loved to travel. I started blogging as expat and honestly, expat bloggers saved my life. I never knew what online community was before I was ensconced in what I used to call "the snow globe" and then, when I started to connect with other like minded expats I understood. A person really could have online friends and meaningful. relationships via the web. 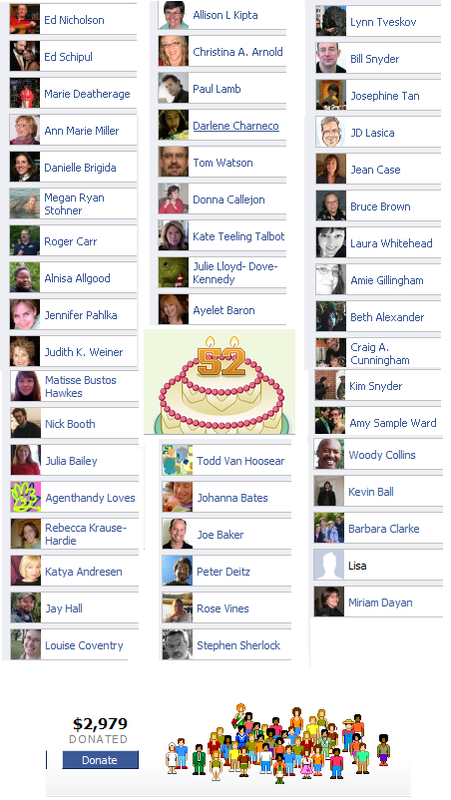 When I started to meet my fellow bloggers and they were 73 times more awesome in person, well... let's just say I got suckered into social media by the kindness of strangers. Who: Four Seattle based travel bloggers. Beth Whitman, Debbie Dubrow, Michelle Duffy, and me, plus EVERYONE WE KNOW! What: Passports with Purpose. We did our first initiative for Heifer International last year, raising $7,400 via our collective networks. This year, we're raising money for American Assistance for Cambodia to build a school in rural Cambodia. Why: Why not? Last year, we had a vague idea about "doing something good" using the collective clout of travel bloggers. Honestly, we were inspired by the Menu for Hope crew. I have a fuzzy memory of Debbie saying to the rest of us, over coffee at Beth's house last fall, "We should do something like Menu for Hope," and all of us responding, "Yeah, okay. That sounds fun." Or some such thing. We had no idea what we were starting. When: NOW! We're rounding up donations -- they go directly to AAC, NOT to us -- until December 21. How much: 13k. But if we go over, we can do things like have a well built or hire a school nurse. Let's just say we'll do as much as we can. I keep having to admit that I sobbed my way across Cambodia. Some places, they just get to you. I couldn't bear it. And when I stumbled over an article about AAfC in the New York times, I KNEW I wanted to do this. And I knew, with absolute certainty that with the help of the travelblogging community, we would succeed. What is your fundraising strategy? How is social media playing a role? How will you define success? Last year, to say we had a strategy of any kind would be to imply that we knew what we were doing. This year, we sold sponsorships to a number of travel based companies -- they were eager to get their brands in front of our community and we are so grateful for their support, they've given us an incredible head start. 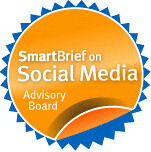 Then, we threw it to our online community via Twitter, Facebook, and we recruit the participation of bloggers. It's pretty organic, it's not like we've said, "Tweet this three times a day" to anyone, but we share all our news in as many formats as possible and we trust that our community will do the same. And they do, go figure. It's been easy because we picked a cause that really resonates with lots of travelers and lots of travelers are online. As for success, well, 13k is success, though it feels like an amazing success already because so many people are talking about the initiative. We'd love to go over our goal because that lets us give for all kinds of extra services. Apparently, we can travel to the school for a ribbon cutting ceremony when it's completed and honestly, to stand there shoulder to shoulder with Beth, Michelle, and Debbie and see what we all helped create, that is the moment I look forward to. What advice would you offer to other bloggers or travel lovers -who want to change the world while they are traveling the world? Travelers are all so different, what makes people open up varies so greatly and there are lots of ways to make change. But I guess underneath it all, if we travel with open hearts, we create change no matter what we do, be it trading stories with strangers or banding together with our community to do something bigger. I'm a ranting advocate of travelers as accidental ambassadors to the world, I think that just the simple act of stepping outside one's home country can create change for the better. Help us free children in Cambodia from exploitation by taking 2 minutes to vote..
To help please vote for the Carpets for Communities project in an online charity competition by going to www.votechildren.org (it will redirect to our main website) and following the instructions to register and vote. Our innovative development project has been selected as a finalist in the Changemakers "Ending Global Slavery" competition by a prestigious panel of judges, from over 200 entries world wide. We understand that we are very close to winning the award and desperately need your help voting for us! The $5,000 prize money (and more importantly world-wide exposure) will all go towards freeing children from exploitation and getting them back to school in Cambodia. Also recent winners received huge financial support following their win (they were invited to apply for up to 1 million in funding!). The winner will be decided by popular vote...you can help us win! We also have a facebook group: "Im voting for CfC to win Changemakers End Slavery Award" Join and invite your friends! don't hold back..you'll feel better for it! Happy Cambodian New Year, Fire in Russey Keo, and One World Cambodia! Happy Cambodian New Year! It was celebrated this past weekend in Cambodia. This time of the year represents the end of the harvesting season. The farmers enjoy the fruits of their harvest and relax before the rainy season begins. In the US, there will be celebrations happening all month long and we'll be going to Lowell, MA next week. The photo was taken by Mongkol who is now back in Cambodia after spending two years in graduate school here in Boston. 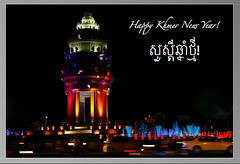 Unfortunately, sometimes holidays in Cambodia bring bad news and this New Year's there was a devastating fire as reported by blogger Jinja. The Russey Keo area has experienced a devastating fire, with over 200 homes burned, taking several hours to extinguish. Agence France Presse estimates ‘thousands’ are now homeless. We’ll never know for sure if it was an accident, or intentional; but the timing stinks. Organizations addressing housing issues such as LICADHO, Bridges Across Borders and Teang Tnaut will tell you that this is not the first community that has experienced a fire as residents attempt to assert their rights. You can see the aftermath of the fire in this YouTube footage. I was looking to see if there were any efforts to help the fire victims and have not come across any. However, on an unrelated note - there is a campaign for One World Cambodia to raise money for some organizations. The One World Cambodia program is designed to introduce young people (ages 18-25) to human rights and development work on the ground in Cambodia. During the nine-week program (June 1-August 1), young leaders will participate in a human rights, development and leadership workshop, then volunteer with Cambodian NGOs. 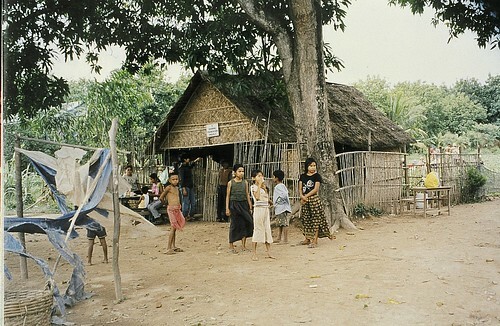 One of the organizations, Bridges Across Borders, works on housing issues in Cambodia. As we were boarding the plane to Florida, I read a tweet from Ben Greenberg and was saddened to learn that Dith Pran, of the Killing Fields fame, had passed away. When we decided to adopt from Cambodia, we tried to learn as much as possible about the country. We read books and rented movies (including the Killing Fields). In those days, I kept a manual blog. 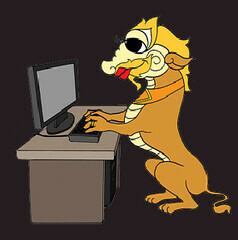 Here's the blog post I wrote about Harry meeting Dith Pran and the Year of the Snake Cambodian New Year's Celebration. 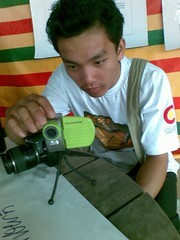 I remember showing Dith Pran my digital camera and he showed him nikon digital camera. He gave me a photography tips. I sent him the photo above that I snapped him holding Harry. Harry did not cooperate. I made a copy of the email thank you note for Harry and some day he will understand the great mean that held him at age 1. Thank you so much to Erin and YouthNoise for the t-shirts and the badges! 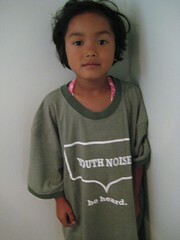 Thank you Tara Hunt, Chris Messina, and Citizen Agency for the T-Shirts and Schwag for Cambodia! 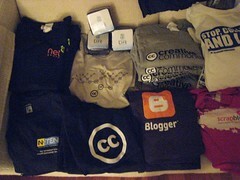 Today a big box arrived from Citizen Agency with lots and lots of t-shirts! Special thanks to Tara Hunt and Chris Messina for the excellent assortment of shirts and stickers. My daughter couldn't resist a photo session! Back in January for the LASA Conference, I did a session with David Wilcox on Social Media that include an introduction and the social media game. I done various remixes -- for example most recently for fundraising and a version for Filmmakers. A number of other folks have remixed the game -- and it's been translated into different languages too. Most recently Nancy White did a version in Colombia. Ihad set up a wiki with the idea of collecting the remixes and incorporating some templates or make it easier for folks to remix. I've been creating the cards in Publisher -- not the most web collaborative tool in the world - and putting the resulting document up as a pdf. The problem is that it isn't easy for people to remix. Nancy White offered me a few suggestions in the comments of a post. We used the game in Cali, Columbia at CIAT, an agricultural research station. Alas we did not have workshop time here in Bogota to run the game at the eLearning conference. But I think it would be a fantastic resource and I'll make sure to share it with the great staff at the Ministry of Education. I will also try and blog about the game - I felt it was a really useful exercise and people appeared really engaged. I will also ask my contact there for any additional feedback. We discussed the possibility of adapting and translating, but as we discussed in email, it sure would be great to liberate the cards from publisher or adobe. Even embedding in MS word is better because more people have the application. Or can you embed pictures in googledocs? In a subsequent email exchange with Nancy, she mentioned that Jay Cross suggested http://www.vyew.com because you can store all kinds of documents. So, now I'm in a time crunch because I need to send it to my Cambodian colleagues so they get it translated into Khmer for next week's conference. I need to create a template that other folks can edit. The template includes text and images and has to be layout for print so the cards can be created. UPDATE: Time crunch .. used RTF because most likely they will use KhmerOS insert Khmer translation. Still in the US in Lowell, MA for the "Rath Family Reunion." When children are orphaned in Cambodia, their last name is changed is "rath" which means orphan. Every year at the annual Water Festival in Lowell, MA, we have the "Rath Family Reunion" where families who have children adopted from Cambodia gather. We attend the water festival, stay at local hotel, eat meals together and have culture lessons. This year Somaly Haye taught our children some dance steps and games. This lesson was really useful because I am hoping that at least one night while in Cambodia I'll get to practice my khmer dancing skills. I met the Khmer Angels! I'm not in Cambodia yet. This weekend is the Lowell Water Festival, the Cambodian American version of the Bong Um Tok. The Khmer Angels were at the Khmer Broadcasting Network booth and signing their CD's and giving away Cambodian flag stickers (finally got one for my laptop). I also got a signed poster. This is a video of the camera kits. I have spent almost all day today testing different ways to compress and host video posts that might work where the Internet access is slow or if you are video blogging from an Internet cafe and the computer does not have windows movie maker on it. It took me a long time because I also made a series of screencasts using jing. It was actually quite liberating not to be carefully scripted and staged. I should do that more often. Note the cameras are very inexpensive. The compression is high. So there are some trade offs to quality. I've included some tips for getting good clips in small video files. Am I missing anything? I decided to show how to use moviemaker because I think it will be important to compress the files. I set up a series of compression tests and plan to see if play at all while in Cambodia. I will also go to an Internet cafe and attempt to upload these files and bring my stopwatch to see how long it takes. I tested three video hosts - blip.tv (which doesn't have online editing yet), YouTube (And YouTube Remix), and Jumpcut. YouTube's Testube has a remix option that uses Adobe video editing. It offers very simple features and the interface is well designed. The only problem is that your remixed video takes forever to get posted on YouTube. That's not gonna work. However, if they can edit offline or if they take a good clip that can be uploaded right out of the camera without editing, posting on YouTube might be a good idea. The reason. There is an active Cambodian community/groups there. Mostly these are Cambodian Amerricans or Cambodian Canadians. I know this because my Cambodian videos on youtube have gotten 20,000 plus views compared to other videos which range between 100-1000 views. I also tested Jumpcut. The interface is confusing. It took me many takes to get it right. Also, it does weird things to the video and the auto posting to your blog does not work. Is there anything else to think about in terms of video blogging from places in the world where the internet access is slow. very slow. said, no problem, "I will make you one." Take time to ask yourself, "What does success look like?" This will help you think strategically about what you need to communicate. Don't establish a personal brand that you can't be true to. Ask yourself what you bring to a particular conversation area that is unique. One of the speakers, Penelope Trunk, told a great story about she learned to deal with email overload that may result from writing a popular blog. She said that spending four hours a day answering email is better than being a garbarge person and to see how popular bloggers handled their email she left comments on the blogs of "a-list" bloggers. They answered her with one-liners and she suggests doing the same. There were a lot of questions about how to build traffic on your blog. I learned that posts that drive a lot of traffic tend to be those that sit on the intersection between two topics. In other words, pick your niche and blog in the center. I visited the blogs of the speakers to discover additional resources for this post. Penelope Trunk has a useful post about how to be better at self-promotion. Nina Burokas handed out a 5x8 card that listed some personal branding dos and don'ts. I went searching online to find it, but was not successful. However, I did find a post on Nina's blog pointing to some additional resources from the session. NpTech T-Shirts for Cambodia! Thank You! Check out the T-Shirts! 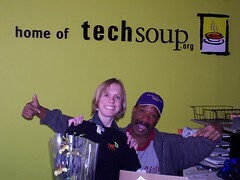 Thanks TechSoup and NTEN! Today I tried adding a music to the video in jumpcut. Really easy to do! 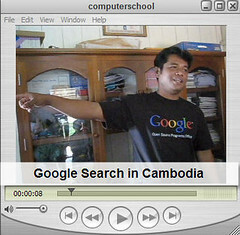 The video was taken with the inexpensive cameras I'm taking over to Cambodia. The purchase of these Video Blogging Kits was made possible by the readers of Beth's Blog who contributed to the campaign. Thank you. Now, I am madly working on the curriculum while also trying to madly finish up work. Here's the first draft of "Video Blogging in Cambodia"
Encouraging Blog Conversations in the Comments: Your Best Tips for Cambodia Wanted! What tools and techniques do you use to create good conversations on your blog? What advice would you offer to Cambodian bloggers? Do you have an awesome example of a conversation on your blog or one that you've started elsewhere? Let me know in the comments below. I'm doing a workshop in Cambodia called "Five Steps to Khmer 2.0" for the Bloggers Summit. I have a half-hour to explain Web2.0 and provide some practical tips to a non native English speaking audience. This workshop was remixed from Associations 2.0 which was based on Marnie Webb's Ten Ways To Use Web 2.0 to Change The World I also created another version for University Extension professionals and one that focused on fundraising/marketing. So, needed to really simplify which was so liberating! What did they say well?